When Dolby Laboratories moved to its new headquarters building in San Francisco a few years ago, one of the items on its to-do list was just like that of any other company as it approaches a new space: decoration. A simple enough item, right? Not for an audio company with five decades of innovation to its credit. The company approached the art on its walls the same way it has approached technology over the years. Dolby, which has neuroscientists on staff to study the sensory perception in the brain, felt the art it features in its offices should in some ways express its business practices. That’s how the team came to install inspiring works by international artists throughout the new headquarters, and what ultimately led to the innovative Dolby Gallery in the HQ’s lobby. A 62-foot-wide Orchid 1.9mm LED display from SiliconCore wraps in an L-shape around Dolby's lobby, immersing viewers in 7.1 million pixels. One stunning example of that is a commissioned piece by Leviathan, the specialized experiential design studio based in Chicago. The art installation, called “Metamorphosis,” combines sight and sound using Dolby Vision and Atmos technology in a genuinely surprising and delightful way: Audio dynamically travels across a 52-channel surround-sound Dolby Atmos system that includes 34 subwoofers. 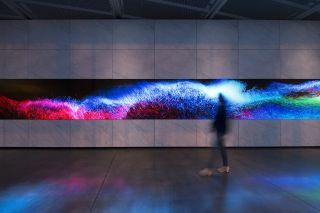 Visuals, which are intricately connected to the audio, envelope the viewer on a 62-foot-wide Orchid 1.9mm LED display from SiliconCore, which wraps in an L-shape around the lobby. Visitors are essentially immersed in a 7.1-million-pixel fusion of art and technology. Lobby visitors often get lost in the virtual art and look for meaning behind the changing patterns. The story is one that connects well to White’s background in fine art, which he called upon for inspiration and, in fact, source material for the project. Using the real-time generator software TouchDesigner, Leviathan extracted color volumes from famous artworks to create a twirling, natural pattern. Then, working with longtime collaborator Joel Corliss, the sound engineer behind Chicago-based Waveplant, audio was assigned to the extracted color data, so the sound moves with the visuals. Like most art, it took some experimentation to get right. For instance, some choices for original art didn’t work with the abstraction, like if the piece lacked contrast, or had too many colors—it turned out that monochromatic or very high contrast art with a limited color palette worked best. The new life, he says, is perhaps even a larger-than-life one. When White toured the Gallery with Dolby to explore the possibilities, he says he was floored at how they’d be able to create a wholly immersive experience.